A call to Gregory Gheraia at Yachting Partners International brings news of a €1 million price cut on the 43m motor yacht Makira. Delivered by Italyachts in 2010 to a design by Andrea Bacigalupo, Makira sleeps up to nine guests in a master suite, VIP stateroom and a double and twin cabin with Pullman berth. 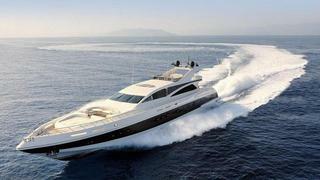 Triple 2400hp MTU engines give her a cruising speed of 30 knots and a top speed of 36 knots. Fitted with zero speed stabilisers and commercially registered, Makira is now asking €9.5 million.